Youth Climate Strike protesters wait for the rally to begin. 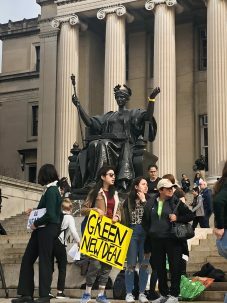 Alma Mater, the beloved Columbia statue, wears a yellow wristband in solidarity. The air was warm and balmy on Columbia’s Morningside campus this Friday morning. One might even say it was too warm; at 65 degrees, the day was shaping up to be at least 15 degrees warmer than the average high for March 15 in New York City. 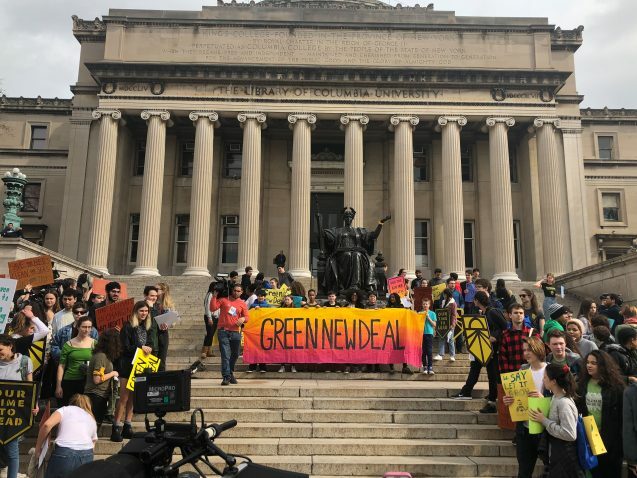 Students from the Columbia hub of the Sunrise Movement wore t-shirts and light jackets as they gathered on the steps of Low Library to show their solidarity with the Youth Climate Strike. This unseasonably warm weather in March is just the type of erratic weather that these students have come to expect, and it’s one of many issues that brought them to the strike. 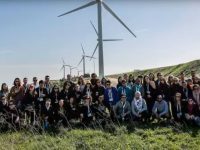 The Youth Climate Strike, a youth-led and organized protest that occurred worldwide, was sparked by Greta Thunberg’s continued strikes from school, which started in August of 2018. Thunberg, a high school student in Sweden, began her strikes alone, sitting on the plaza outside the Swedish Parliament with homemade signs demanding climate action. 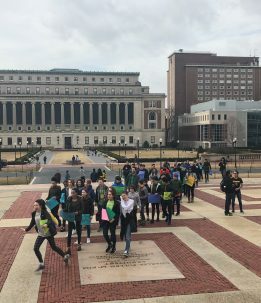 High school and middle school students walk up the steps of Low Library to join the college students of the Columbia Sunrise Movement hub. 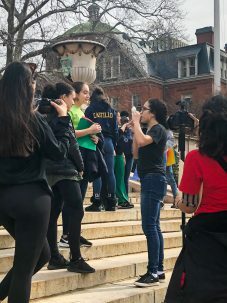 As the strikers stood on the library steps, a group of about 40 middle and high school students entered campus holding signs. The college students on the steps cheered them on, welcoming them and waving their signs in solidarity. Most of the college students involved in the movement are 18 or will be shortly, and can vote in the next election. 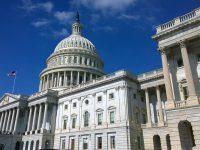 But for the kids in high school and middle school, this is the only way for them to express their political concerns and attempt to change the minds of the adults who—for now—control their futures. Naomi Hollard (right), a Columbia senior and leader of the Sunrise Movement’s hub at the university, speaks with two younger students. The younger students gather for a photo to show off their homemade signs. With college students on one side and younger students on the other, the strikers made an impression. 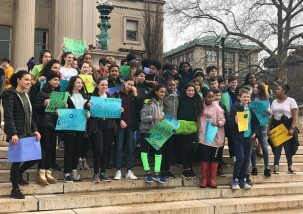 Middle schoolers hold up the Green New Deal banner in the center.